FIGURE 11 ■ Accessory right renal artery. 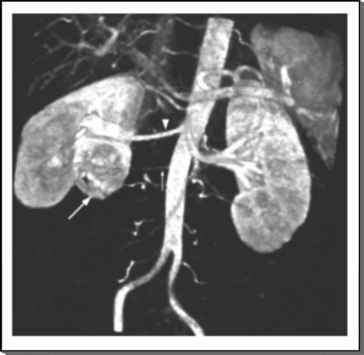 Vascular phase vol ume rendering shows an accessory right renal artery (arrow). 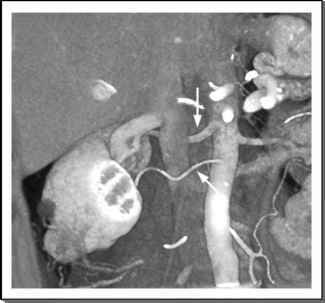 Right renal arteries that arise from inferior side of the inferior vena cava, off the aorta, often course anterior to the inferior vena cava, as in this patient. FIGURE 12 ■ Depth of tumor extension. Tumors that extend into the renal hilum (arrow) will often abut larger vessels and the pelvocalyceal system (thin arrow). This is important for the urologist, who may opt for conservative surgery or be ready to anticipate repair of the collecting system and cauterize the vasculature. The laparoscopic ultrasound transducer is constructed with the transducer elements on a flexible arm that fits through a 10 mm laparoscopic port. The transducer elements can typically be steered into different positions, although limited by the access ports and flexibility of the transducer. Doppler capability is helpful to identify vascular structures in proximity to the surgical site. images, are used for intraoperative ultrasound during partial nephrectomy, whether open or laparoscopic (Fig. 16) (29). Such probes are smaller in size than conventional probes, and are shaped for the laparoscopic operative environment. The ultrasound transducer can be placed directly on the surface of the kidney during an open partial nephrectomy. FIGURE 13 ■ Magnetic resonance imaging of renal cell carcinoma. 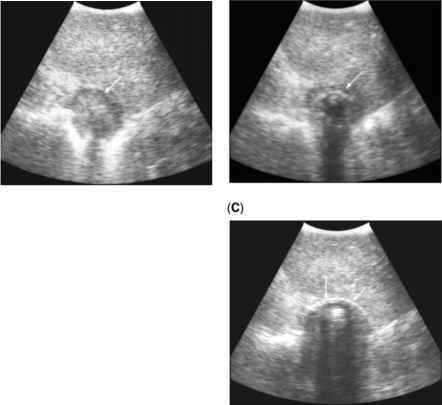 (A) Precontrast, (B) equilibrium postcontrast fat-saturated three-dimensional gradient echo T1-weighted (VIBE) images, and (C) subtraction image of a partially exophytic right renal mass (arrow). Tumor enhancement on the postcontrast image is confirmed on the subtraction image. This is most helpful when there is high-precontrast T1 signal in the investigated lesion such as that from internal hemorrhage. The lateral renal cyst does not enhance and is black on the subtraction image (arrowhead). FIGURE 14 ■ Volume-rendered arterial phase magnetic resonance for renal vasculature. Both the main right renal artery (arrowhead) and a small inferior accessory renal artery (thin arrow) are demonstrated on this volume-rendered angiogram. The partially exophytic tumor (arrow) is also seen. The arterial phase fat-saturated three-dimensional gradient echo Tl-weighted (FLASH) data were used to create the image. 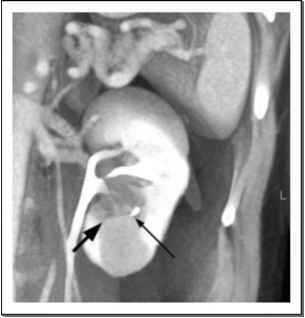 FIGURE 15 ■ Renal vein evaluation by magnetic resonance. Oblique, coronal, thin, maximum-intensity, projection images show two right renal veins (A, arrows) and left renal vein expanded by tumor thrombus (B, arrow) that does not extend to the inferior vena cava but is seen to extend into the left adrenal vein (arrowhead). The images are derived from the equilibrium phase postcontrast fat-saturated 3-D gradient echo Tl-weighted (VIBE) data. 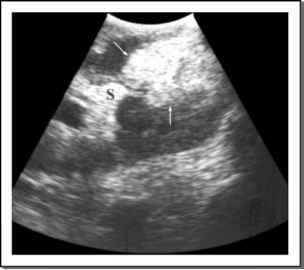 FIGURE 16 ■ Intraoperative laparoscopic ultrasound shows an ovoid hyperechoic mass (arrows) that extends from the lower pole into the hyperechoic fat of the central renal sinus (S). During laparoscopic partial nephrectomy, unless a hand-assisted procedure is performed, the ability of ultrasound to localize a renal mass is invaluable, because the tactile cues available during open surgery are not available. Laparoscopic ultrasound is also used to guide and monitor both cryoablation and radiofrequency ablation of renal masses. Ultrasound findings correlate well with the actual size and location of the iceball at surgery. Scanning from the surface opposite the cryotherapy probe ensures that shadowing does not obscure deep margin and protects the probe from the cryoablation. Using multiple probe positions (i.e., rotating and translating the probe along the renal surface) may be necessary to ensure complete ablation. Extension of the iceball more than 3 mm beyond the tumor margin ensures adequate freezing of the lesion for cell death. masses and assess the proximity to the central sinus structures, the pyelocalyceal system, and vessels. The margins of the mass are determined using ultrasound and subsequently demarcated on the renal surface using the electrocautery to score the kidney surface. A search for additional lesions that may not have been identified on preoperative imaging is also performed. 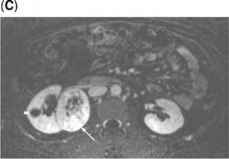 Most masses treated laparoscopically are small, and some may not be visible on the renal surface. After identifying the mass by ultrasound, the surface of the kidney is scored using electrocautery as during the open procedure. The position of the mass, as determined by preoperative imaging and any history of prior retroperitoneal or abdominal surgery, is the information used to determine the laparoscopic approach. Once the kidney is mobilized and fat excised for pathological analysis, the tumor and remainder of the kidney are imaged with ultrasound. The mass is biopsied and then punctured with the ablative probe under ultrasound guidance. The probe is visualized as an echogenic line that casts an acoustic shadow. The critical steps of cryoablation are rapid freezing, slow thawing, and repetition of the freeze-thaw cycle (30,31). The cryoprobe tip is advanced to the deep margin of the mass. The probe tip defines the deep margin of the ablation zone. Cryoablation, unlike radiofrequency ablation, creates a distinct margin of the ablated tissue on ultrasound. The deep margin of the tumor is most at risk for incomplete ablation (32). As cryoablation progresses, an iceball is seen as hyperechoic arc with posterior shadowing (Fig. 17). 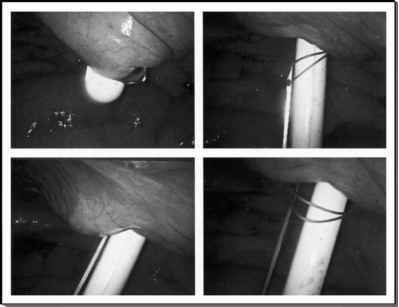 FIGURE 17 ■ Laparoscopic ultrasound monitoring of renal cryoablation. (A) Initial image shows the mass (arrow). (B) As cryotherapy begins, iceball formation is seen as a short, hyperechoic arc (arrows). (C) As iceball enlarges, the hyperechoic arc (arrows) increases in size, and shows increasing shadowing.